Funny story: this is exactly how I look when John places a plate of cupcakes in front of me and says, "Away!" Of course, then I go all [censored] on his [censored] and get them anyway. Lesson learned! Note: Stacey initially sent me The Soup's version, but this was the only embeddable video file I could find. So my apologies for the crazy spaghetti cat at the end. "The balloons just had a really strong tailwind, that's all. Oh, and the inscription? 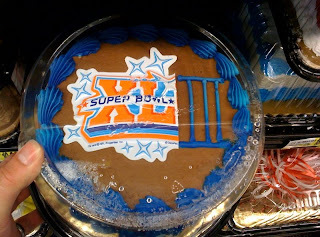 Uh, yeah, that was the tailwind...too..."
It's nice to see the bakers here in the U.S. aren't picking sides when it comes to Super Bowl cakes. Nope, they wreck 'em all equally. Well, one out of three ain't ba....no, actually, that IS bad. Ok, I have to admit it: when Anne-Marie mentioned the "terrible towels" in today's earlier post, I had no idea what she was talking about. Fortunately, a reader has informed me that these are yellow towels Steelers fans like to wave about during game days. (I suppose it's too much to hope that this is a tradition somehow inspired by Douglas Adams?) Heh, you sports fans make my wearing a Bajoran earring to a Star Trek Convention seem almost normal. 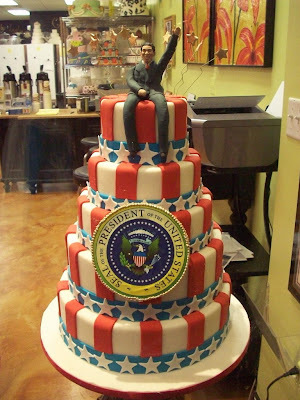 But you still have to wonder: did the baker feel even the slightest pang of irony? 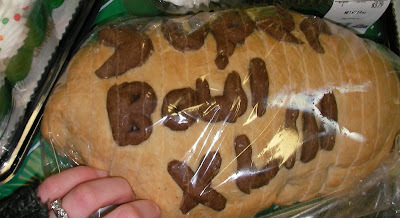 Oh, and remember a few ages back when I made a crack about how next bakeries will be decorating our loaves of bread? 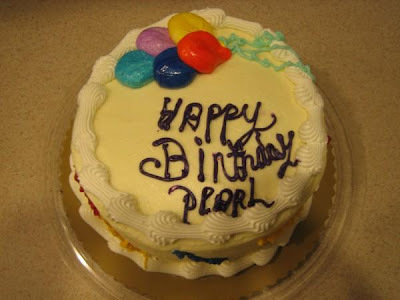 [shaking head] Well, at least they used dough instead of frosting. That's something, right? That, or s/he is venting some pre-game frustration. Many thanks to Krista W., Catie P., Diana W., Jennifer H., and Corrie R., some hoopy froods who really know where their towels are*. *If that last statement baffled/consternated/frightened you, go here. 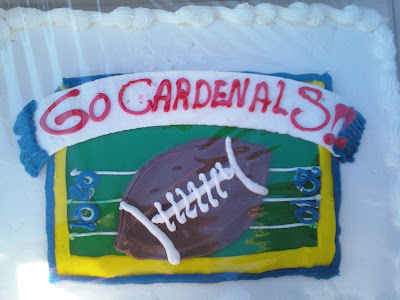 Hey Superbowl fans, Anne-Marie here! Did you know the Big Game is right around the corner? Yup, time to get those Terrible Towels and foam fingers out of the basement, whip up a yummy batch of deep-fried cheesy sausage poofs, and plunk down on the couch for five hours of testosterone-fueled annihilation!! A little swirled poo, anyone? "Or, hey, we don't have to use all those cupcakes! 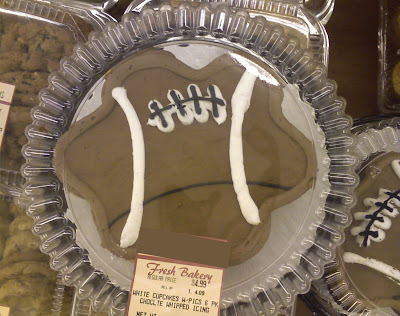 How about just four, and then put a big plastic football on top?" "Oh, or there's always recycling! 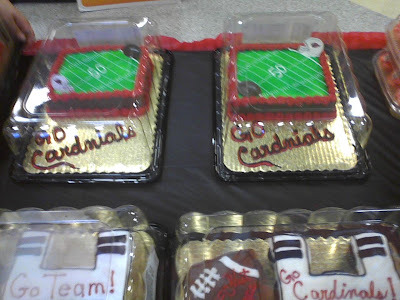 Don't we have some leftover baseball cakes from last year's World Series? Let's use 'em! I'm sure no one will ever notice." 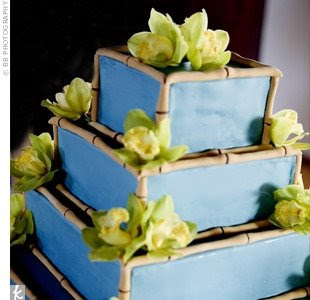 Thanks to Stephanie R., Jennifer W., Jennifer T. and David C.! I realize that some of you are about to get extremely upset with me, so allow me to apologize in advance for any sudden peaks in blood pressure or massive coronaries this post causes. 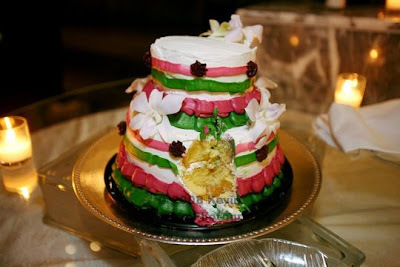 You see, judging by some of the e-mails/comments I've received in the past, apparently every time I publish a post without a cake in it lovers quarrel, birds fall from the sky, and another angel dies. Or something like that - I couldn't really tell through all the trollish grunting. 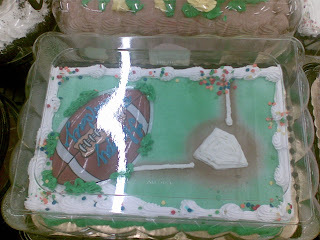 Yes, folks, much as I hate/love to admit it, Cake Wrecks has been nominated on another awards site. And yes, I will now ask you - with what I hope is an appropriate amount of humble self-loathing - to consider voting for it. If you can see past the blinding hatred this request has incurred, that is. 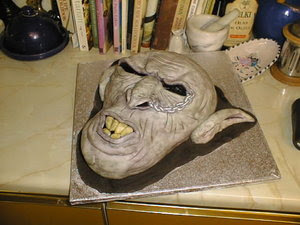 I mean, sure, there's no cake in this post, BUT, what if I promise to flog myself most vigorously later this afternoon? Could we call it even then? What's that? The award thing? Oh, right. 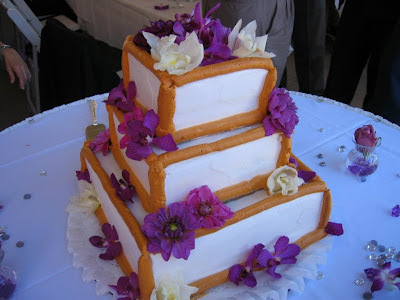 It's the famous Bloggies, and Cake Wrecks has been nominated in three categories: Best New Blog, Best Writing, and Best Food Blog. As I said in my sidebar notice which no one has noticed: if you don't agree with my being nominated for Best Food Blog, please, don't vote for me there! All of the other nominees are fantastic blogs, and well deserving of the win. Still, you have to admire the wreckerator's tenacity in scrawling the inscription right over the plastic flotsam. That, my friends, is commitment! No namby-pamby dashes, squished text, or downward spirals here, no sir! 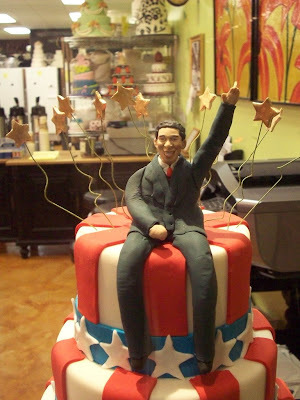 This baker does not deviate, does not falter! 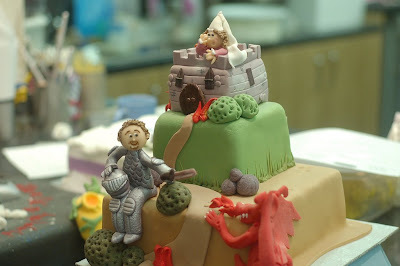 S/he trudges onward even in the face of crippling ridicule, turning a deaf ear to nay-sayers, a blind eye to the warning signs of impending disaster, a numb hand to the piping bag, a stuffed-up nose to the smell of burning batter, and an insensate tongue to the bitter dregs of defeat!! Ok, so maybe I was reaching a little with that metaphor. I thought I was doing well until the "burning batter" bit, though. [taps teeth with pen] Huh. Still, I think we can all learn something here. 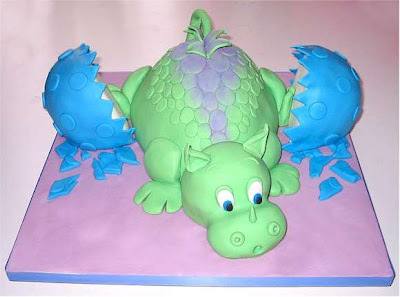 Something about perseverance, something about throwing caution to the wind, something about...oh, I dunno... picking the cake up more than 30 minutes before the party starts? [nodding] Yeah, that, too. ...the creepiness factor pretty much goes off the hilarity scale. 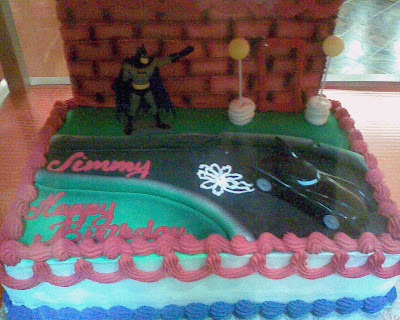 Submitter Anony M. would also like me to point out the giant crack down the middle where the two cakes were cemented together, the black and yellow icing bleeding into each other, and the fact that this cost $150. That may all be true, Anony, but in my mind any cake that lets me reference old Police songs is well worth someone else's hard-earned money. What, that doesn't sound so bad? Then allow me to introduce a new Wreck series: Caped Catastrophes. Today's first lucky victim? The Bat Man himself. 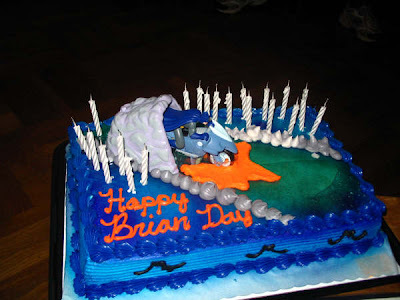 Here Bat Boy rides out of a plastic drain-pipe on a magma slick in glorious celebration of "Brian Day". Um, are those things on the side supposed to be bats, Clarissa D.? "Wait - come back! I didn't mean it! I DON'T miss that new-car smell, honest!" I agree that the door in the brick wall is a little odd, Ashley W., but what I really want to know is how the Batmobile can leave a cloud of snow-white exhaust shaped like a hibiscus flower. These Bat gadgets - they just get cooler every year, don't they? "Blasted Baked Balls of Blue! I can't...quite...reach you!" 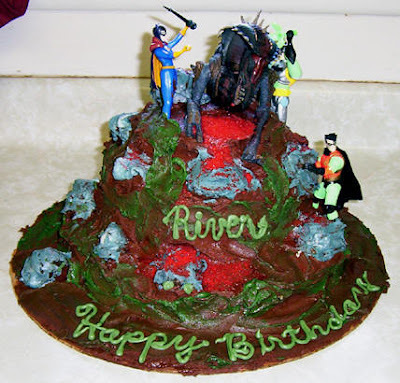 I'm not sure if "River" is the birthday person's name, or if - in the tradition of Wreckerators everywhere - the decorator just labeled the cake what it's supposed to look like. If that's the case, then s/he must have meant "cascading river of blood, cement, and mold". But, you know, that probably wouldn't have fit. 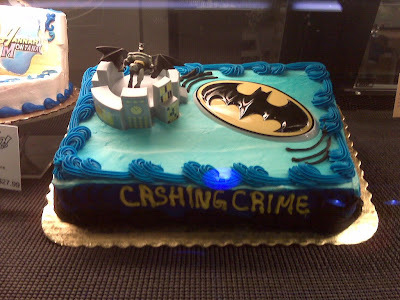 Now remember, kids: crime doesn't pay. Right, Batman? 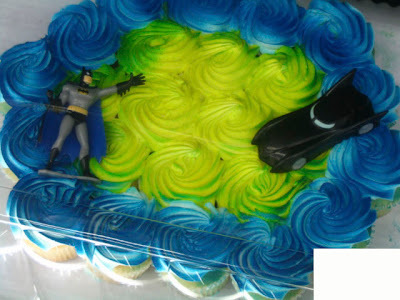 But you know, all these cakes are totally cheating: they each use plastic Batman figurines! 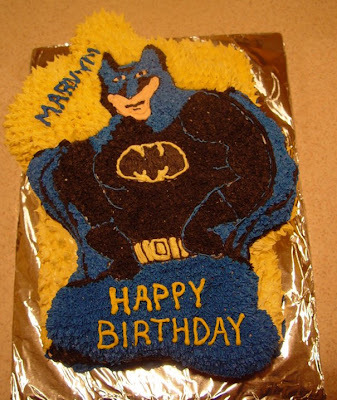 Why aren't decorators actually drawing the caped crusader? Oh. That's why. Thanks, Nicc. [shifty eyes] Um, and can I just say that that's an unfortunately appropriate placement of the "pp"? Have a superhero Wreck you've been meaning to send me? Then send it in soon; I'll be continuing the Caped Catastrophes theme over the next few weeks. 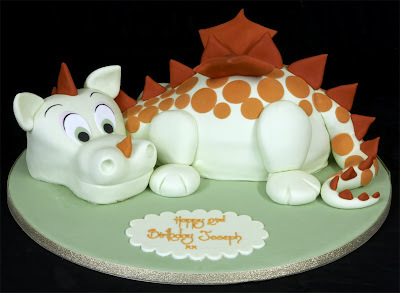 Those scales must have taken forever! They look great, though. Shanna R. found him on Courtney's Cakes Flickr stream. I love the simple-yet-ingenious "bushes", and the knight and princess are just spot-on perfect. Great stuff. Found on Manray3's Flickr stream. 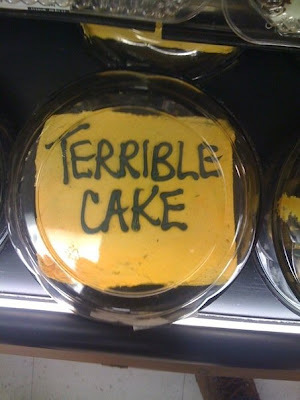 I've been told this may be from The Cake Shop in the Covered Market of Oxford, England. 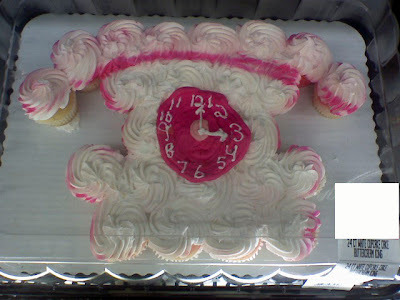 If you guessed "time to learn the difference between an old-style telephone and a clock", then you are absolutely correct! I would have also accepted "Time to ban CCCs" or "Time to train a wreckerator". Any other suggestions? 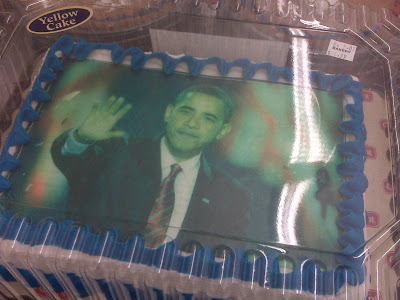 Of course, it could also be used as the poster-cake for the call to ban edible image printing. Really, who thought technology that allows you to eat people's photos was a good idea? It always ends up looking rather creepy. 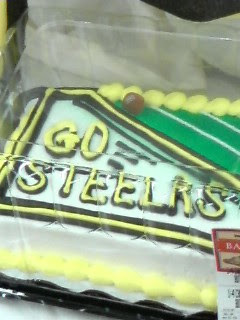 Mmmm, now there's an appetizing composition. 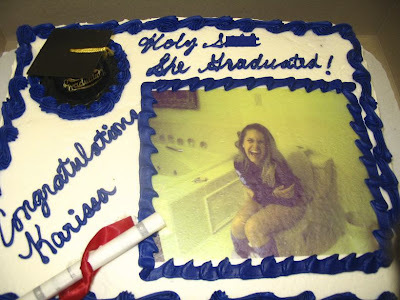 I bet all of Karissa's relatives were SO proud. And full. As in, "no-really-I-couldn't-eat-another-bite" full. "Mo-ooom! Have you seen Giselle?" "Suzy, what did I tell you about leaving your dolls lying around?" "You don't know? So you're telling me you don't remember any of the HUNDRED times I've warned you about leaving your toys strewn around the house?" "So you don't remember what I said yesterday? About what would happen if I found your doll on the floor one more time?" "Ummmm... Maybe you said something..."
[whining] "But I want my dolly! You HAVE to give her BACK!" "Oh, don't you worry, honey. I'm sure she'll turn up after dinner." That's cold, Chad C. - real cold. This is a day for the history books, folks! Yep, that's right: today I opened a fresh tin of Godiva dark-chocolate-covered pretzels, and only ate two. I know: impressive, right? 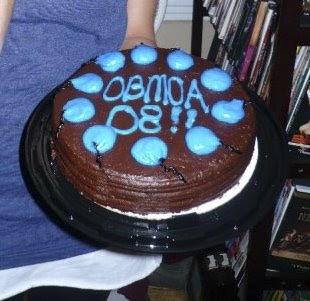 Oh, and Barack Obama is being inaugurated as President of the United States. That, too. 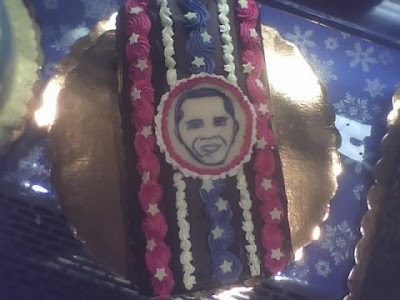 This election-night Wreck's irony is twofold: 1) it's from a bakery in Chicago, and 2) the wreckerator responsible made a point of telling Chelsea M. what a big Obama supporter she was. 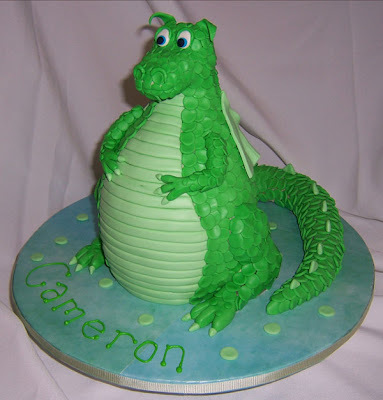 [looking at cake again] Yeeaah. Kinda makes you wonder what it would have looked like if she didn't like him. 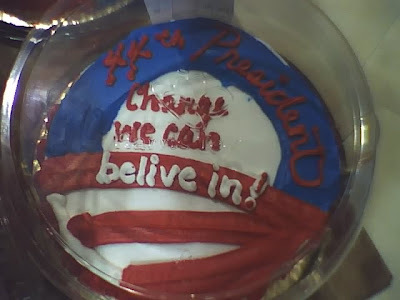 "Change we can belive in!" [tilting head] Huh. You know, Zach S., from where I sit it looks like the White House is leaning a little to the left. Obama logs! 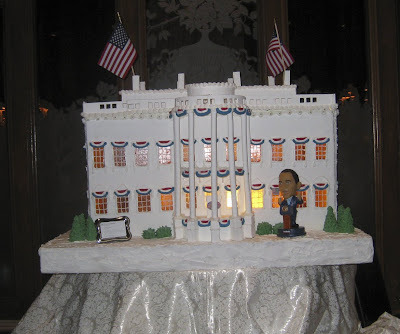 Or as she dubbed them, "Presidential InLOGuration Cakes". Heheheh. First thought: "Wow! 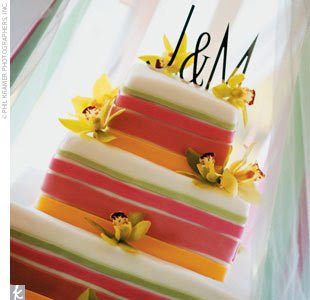 So pretty!" Second thought: "Whoah, is he... I mean, does it look like...Uhh...Yeah, maybe I better zoom in..."
3rd thought: "Why am I suddenly reminded of Howdy Doody?" 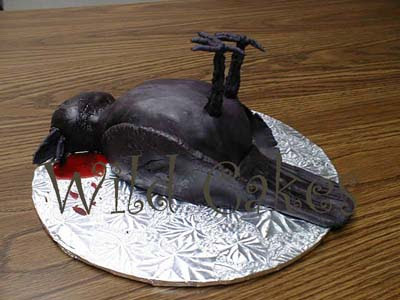 Quoth the Raven, "Nevermore" nevermore? Today is the 200th anniversary of Edgar Allan Poe's birthday (thanks to Amy H. for calling my attention to it). If you don't know who that is, you probably didn't get this post, either, and should remedy the situation immediately. Sunday Sweets is our weekly NON-Wrecks feature. 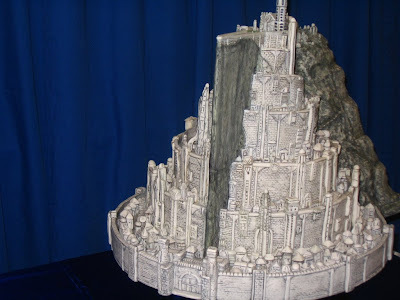 This week we're looking at some Tolkien-inspired beauties. 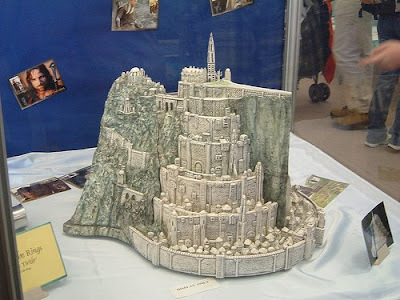 I think this was displayed at a fair somewhere, and yep, it's cake. Amazing, huh? 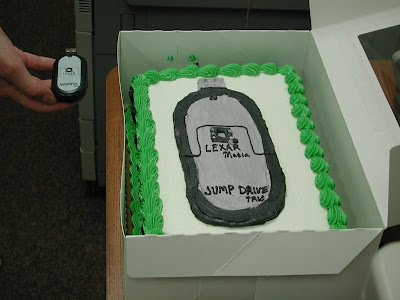 A lot of folks have pics of this cake in their Flickr accounts, but I'm not sure who actually made it. 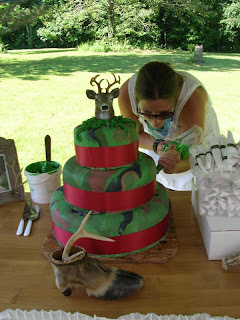 Y'all let me know in the comments if you have a site for the baker, ok? 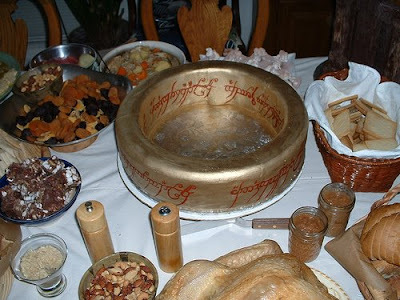 The elvish script is just perfect, and the gold sheen looks fantastic. 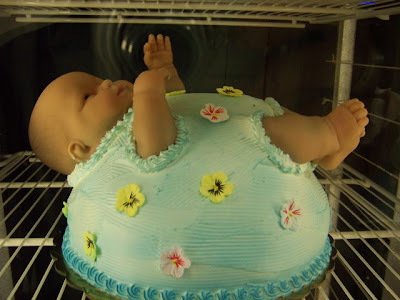 Again, not sure on the baker for this one. Thanks to Michelle F. for submitting it. 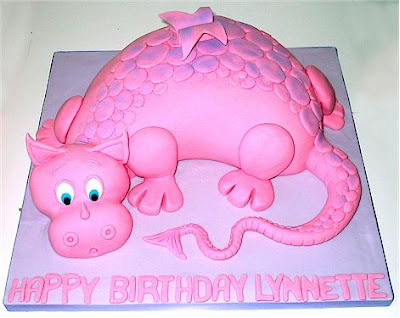 The creator is Cakeworks of Calgary. Thanks to all the rest of you who submitted photos! 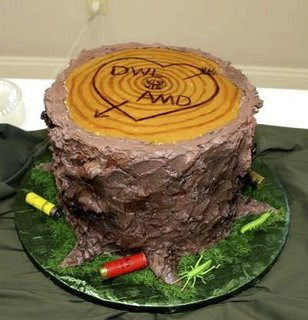 Remember, if you have a cake you'd like to nominate as a Sweet, send it to Sunday Sweets [at] Cake Wrecks [dot] com. Sorry, sorry - I promise I almost never do this, but I just learned something that I think will interest/concern a lot of you Wreckies out there. If you enjoy supporting local artists and makers of hand-made goods, please keep reading. In August the Congress passed the CPSIA, a law making it tougher to sell toys and other childrens items that contain lead - so obviously that's a good thing. However, as a result of this law any crafter or stay-at-home artisan who makes items for kids under 12-- from clothing to toys to school supplies - must have their items tested to the tune of $400-$4000 per item. Since most crafters cannot afford those kinds of fees, this means tens of thousands of stay-at-home moms and small home-based businesses may be forced out of business come February 10, the official "mandatory compliance" date set by the law. As a small business owner and indie-art-lover I was distressed to hear of this from reader Laurel, especially considering it's an easy fix: all that's needed is a simple amendment excluding micro-businesses, similar to the exemptions granted by the FDA for small producers under the food labeling laws. So, if you want to help save Etsy sellers, stay-at-home crafters, and countless other small businesses, please visit the Handmade Toy Alliance. There you'll find a sample letter you can send to your congressman and an online petition you can sign, in addition to lots more info and links. Remember, the deadline is February 10th, so please act now if you're going to. And that's it! We now return you to your regularly scheduled Wreckage. UPDATE: A few of you have referenced Snopes (an urban legend/rumor fact-checker) in the comments, saying they called this law a false rumor. However, what Snopes was addressing was the resale of USED children's items and clothing, which will in fact still be legal after 2/10. (Click here to read the article.) All new items are still affected by the law. UPDATE FROM JOHN: Um hi. The comments on this are done. It's all very interesting and I strongly suggest y'all read up on it further. And if you are desperate to make your voice heard, please send a letter to your representative, write about it on your personal blog or even e-mail your friends but I would ask that you not comment on other posts about this one. The only reason I am not taking this down is that Jen really does care about small businesses and she was trying to do a good thing by letting all of our awesome readers know about something that concerned her. That's it. Wreck On and happy Martin Luther King day! And you're right, Nicole P.: it IS a little dotty. 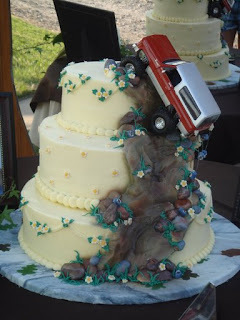 By popular demand, here are a few more Inspiration vs Perspiration Wedding Wrecks. And shame on you all for finding them so funny. 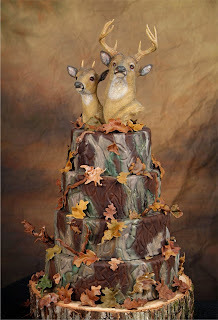 Uh, since the cake itself leaves me speechless, I'm going to comment on the background. Hey Jessica M., is that Chewbacca through the window? I mean, given the Han Solo & Leia topper, I was wondering if Chewie was the ring-bearer or something. 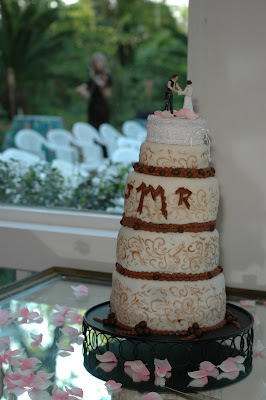 You have to wonder if that swipe was a result of the bride fainting at the sight of it, don't you? Still, I guess she should count her blessings: imagine if the wreckerator had been asked to write something on it!